A damage shield is basically a layer of protection which absorbs incoming damage. A number of Skills provide damage shields such as Blazing Shield (Templar), Steadfast Ward (Restoration Staff) and Bone Shield (Undaunted). These Skills all have a specified shield value and duration which applies to the damage shield effect. The mechanics of damage shields work differently compared to other types of damage mitigation like Armor and Spell Resistance. A damage shield places a layer of protection which will absorb all incoming damage until it is either destroyed (the damage exceeds the shield value) or ends (at the end of the duration). The value of the damage shield determines how much damage can be absorbed before it is destroyed. It is important to remember that a damage shield has no mitigation itself (Armor / Spell Resist). This means that a damage shield will take more damage than your character would because you have some mitigation. This is why damage shields is not like boosting your Max Health. Blazing Shield is a typical damage shield example, it provides a damage shield to the caster (player) with a value of 30% Max Health. So if my Health was 20,000, then my damage shield value would be 6,000. My damage shield would last until an enemy did more than 6,000 damage to it or 6 seconds, whichever is sooner. All damage shields operate with a “first on, first off” rule. This means that you can stack damage shields on top of each other but the first shield that you cast will remain on top taking damage until it ends. So if I cast Blazing Shield and then Steadfast Ward, the Blazing Shield would absorb any incoming damage first and then when it ended the Steadfast Ward would take the rest of the damage. Also note that you can’t stack damage shields from the same Skill – so I can’t stack 3 Blazing Shields on top of each other. 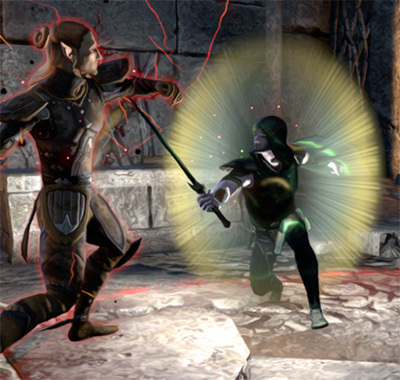 In Cyrodiil and Imperial City all damage shields are reduced by 50%, along with all damage and healing. This is part of the Battle Spirit effect which will also reduce damage and healing values by 50% in an effort to reduce the time to kill in PVP. There is currently a bug which does not allow critical strike to occur on damage shields, which will hopefully be fixed. There is speculation that a bug exists where any “overflow” damage when a damage shield is destroyed is then applied to the target without mitigation. While this may have existed at some point, after extensive testing there is no longer evidence of this bug. The testing involved Blazing Shield on a character with no other Attributes or Skills and the damage recorded followed known mechanics. The damage against the damage shield was indeed not mitigated, but any extra damage was mitigated with Armor or Spell Resistance. If you have something that reduces incoming damage will that reduce damage done to the shield as well? Do damage shield cap at your max health or is it limitless? ie. you have 20k health you would not be able to stack up a 30k shield? Who contributes to this? There are several threads that argue to the contrary. CP points in Bastion, Hardy and Elemental Defender all offer mitigation to shields. That would mean the OP and Dodo are wrong. I tried linking a thread on ESO forums, but my post is blocked when I do. Love this site so I’d like to add the forum post with formulas I found, “Damage Mitigation: Explanation UPDATED FOR MORROWIND! NEW CALCULATOR!” It has a list of mitigation effects that are applied before damage shields and those like resistance and blocking that’s applied after. It also states don’t confuse this with damage shields having mitigation, they don’t. There’s also a work in progress damage calc link. Very insightful. Anyone know if ironclad has any effect on shields?